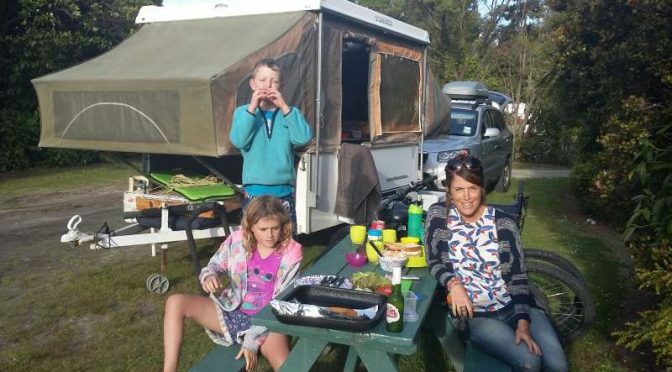 Our family loves camping and has many happy memories spent in campgrounds all around New Zealand. 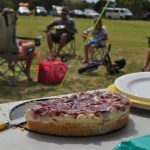 We recently started looking at upgrading our camper trailer and it got me to thinking that the camper trailer ( if you aren’t familiar with the term it’s the featured image for this post ) is probably the easiest and possibly cheapest ways to get into camping. My husband and I both spent out childhoods camping with our families. My husband spent the summers in a borrowed canvas tent ( borrowed from the local scouts where my father-in-law was Scout leader ) with no floor and wasn’t very waterproof. I on the other hand spent the winters ( yes the winters, we kayaked and there was more water in the river in winter ) in a camper trailer or VW combi van with the kids ( and one of those kids was me ) in a tent. My husband and I both camped in Department of Conservation campgrounds as children, where the biggest luxury is a long drop toilet. Unfortunately I didn’t initially embrace camping as an adult as I thought I had an allergy to the grass and camping was quite annoying as my feet would end up lumpy and painful. Turns out that my feet are very sensitive to the sun and my feet issues were resolved with some spray on sunscreen so thankfully we could happily buy our first tent and embrace camping as adults. We had many happy years in our tiny dome tent that we couldn’t stand up in, and packing everything in to the car at night as there was no room in the tent to store it. 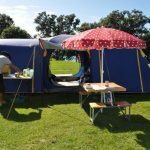 After a fabulous road trip around the Taranaki region, we decided to upgrade to a tent that we could stand up in with a vestibule. I am not really sure what a vestibule is but I do love the sound of the word. Of course with our bigger tent we had more space for things so bought a wee table and camping pantry. No sooner had we taken the tent for its maiden journey than we discovered we were having our first child …hmm might need to add a room onto that tent. When we were a family of three we enjoyed many camping weekends away. And at this point I might lose my adventure mumma street cred when I say that two kids made me less so inclined to pack up the tent and head away camping. Not to mention we would have needed camping bunks to fit into our tent. And so I have to hand it to my awesome bunch of friends who got us back into camping when our kids were a little older. And time for another tent ( yes that’s our third tent )….a 3 room one this time. Very luxurious. And with all that space we bought another table and a comfier airbed. And yes at this point we had such a big tent and so much stuff to put in the tent ( I might camp but I don’t like to lower my standards ) that we had to hire a trailer to get everything in. Packing was quite an undertaking and we found we weren’t going away camping as much we would have liked. Enter the camper trailer…beds, bedding, table, seating, cooker, plates, gin glasses ( enough for the whole campground if you are like me ) all packed up and ready to go. We love our camper, its so much easier to pack ( all we need to pack is clothes and food ), easy to set up, robust canvas that has never leaked in the rain, doesn’t get blown around in the wind and the canvas is so dark that the kids even sleep in when we are camping. 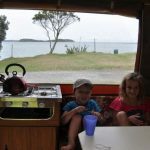 We recently spent 3 weeks travelling around the South Island in our camper trailer and thoroughly enjoyed it. When I look at all the camping gear we have bought over the years I think the best place to start would have been a camper trailer. If you want ease of packing and setting up look into getting a camper trailer. You can spend $30,000 on a new flash one but we got ours second hand for $2,500 which we estimate would have been about the same amount as the camping equipment we have bought over the years. The time saving on packing is priceless and because its easier to pack we go camping a lot more and even go away for one night, which we wouldn’t have done with the tent.